Many businesses that could already be benefiting from cloud storage are holding back due to security concerns. 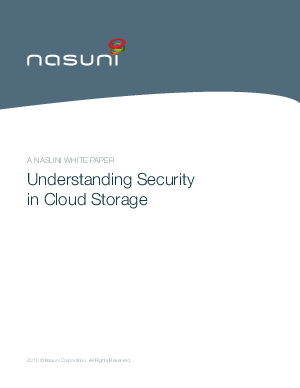 The cloud offers the opportunity to significantly reduce cost while providing reliable, on-demand storage. While no environment is completely secure, cloud storage does not inherently increase security risks to your business. Much of the fear stems from a lack of understanding around cloud security and, simply, peoples’ natural reaction to any new technology. Our aim is to identify the major risks and to explore the security models that can be used to mitigate them. We explore security in the context of the different types of cloud offerings available: Software as a Service, cloud compute and cloud storage. Data encryption at rest where only the user can decrypt the data is singled out as a unique capability of cloud storage, which enables a superior security model. The OpenPGP security standard is discussed at length in the context of data encryption. Nasuni makes the Nasuni Filer: a virtual NAS that offers secure connections to major cloud storage providers. We attempt to offer a neutral view on all of the security issues; however, when building our system we chose a specific security model that we felt was the best fit for the problems at hand. At the heart of Nasuni security model is OpenPGP. We offer an in-depth description of our implementation of OpenPGP in the Nasuni Filer.